Amina of Zaria | Take Back Halloween! Amina (ca. 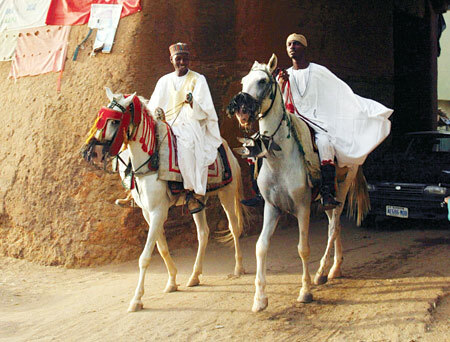 1533-1610) was a brilliant warrior queen of the northern Nigerian Hausa state of Zaria. She is remembered in song as “a woman as capable as a man,” which is rather understating the matter, seeing as how Amina was the greatest ruler and warrior in Nigerian history. 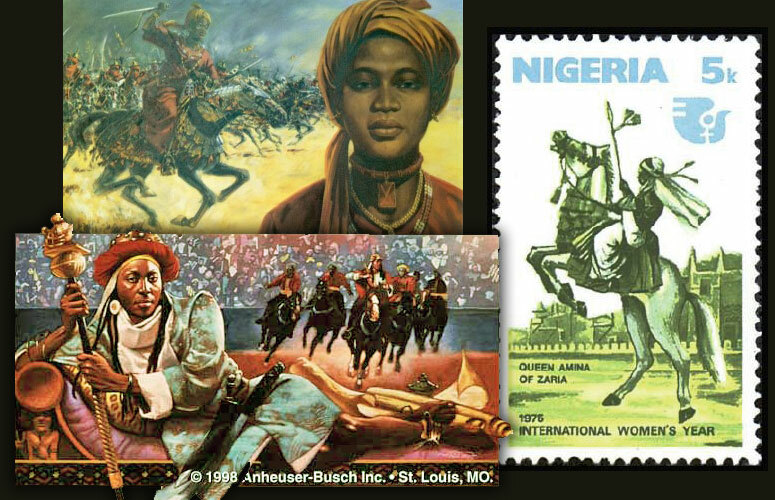 For our illustration we’ve used three images of Amina: the painting on the bottom is by Floyd Cooper (for the Budweiser African royalty series, hence the copyright), the one on the top is by Erhabor Emokpae, and the image on the right is an official Nigerian stamp from 1975. 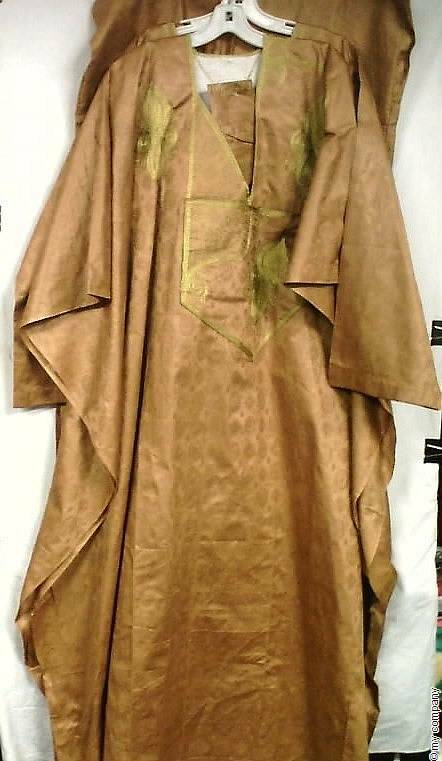 Now, for the costume: basically, you need a babban riga, or as it’s more popularly known outside Nigeria, a grand boubou. This voluminous multi-layered outfit is now worn by men throughout West Africa, but it was originally the clothing of the northern horsemen. Since Amina was very much a horse-riding, weapon-wielding queen, that’s probably the kind of thing she wore. If a friend or relative already has a grand boubou you can borrow, you’re in luck. If not, you can search for a used one on eBay or buy a new one; we give you a link below for a store that has rock-bottom prices. As for Amina’s headgear, Floyd Cooper (the Budweiser artist) shows her in a very sultan-ish turban, which we think is a nice touch. This was the 16th century, after all, and Amina was definitely living in a world of sultans and emirs. 1. Four-piece Grand Boubou set (pants, top, robe, hat) from Decoraapparel . These come in a variety of colors; all are a large one-size-fits-all. 2. 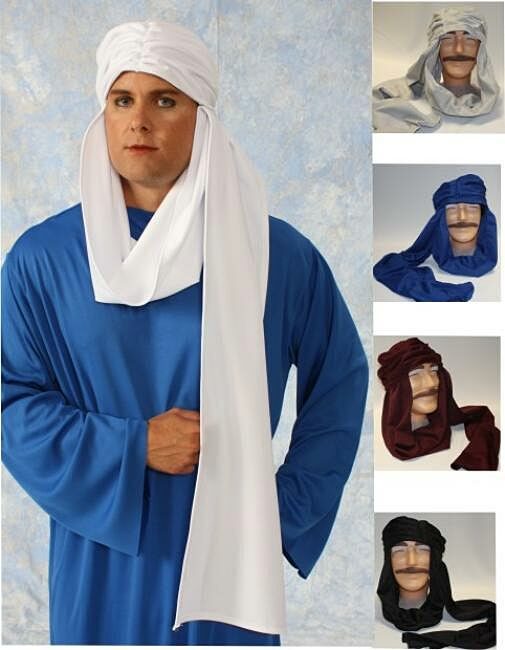 Costume turban . In white, gray, blue, burgundy, or black. 3. Costume scimitar. Wear a leather belt to hold it. 4. Costume scepter. Note that this is only 19 inches long, so it’s very much just a waving-around-for-show scepter.